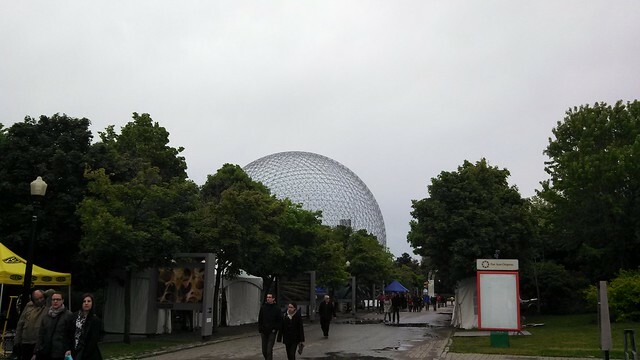 As I have mentioned already, the weather during my weekend in Montreal turned out to be a bit of a bummer. I had to deal with a cold, soggy city, and try to figure out a new plan of attack for my time there. Since the last time I had been to Montreal was for NYE 2012, in the dead of winter, I found myself somewhat repeating my previous trip and the things that I did. Nothing wrong with that, but I was here to explore new things in a supposedly different season! Luckily some of the things that I neglected on my previous trip or were closed during that time weren’t an issue. That meant I got to check out several of the city’s museums, one of the markets, ride a bike through the streets, and a few other things. I was going to save this trip! 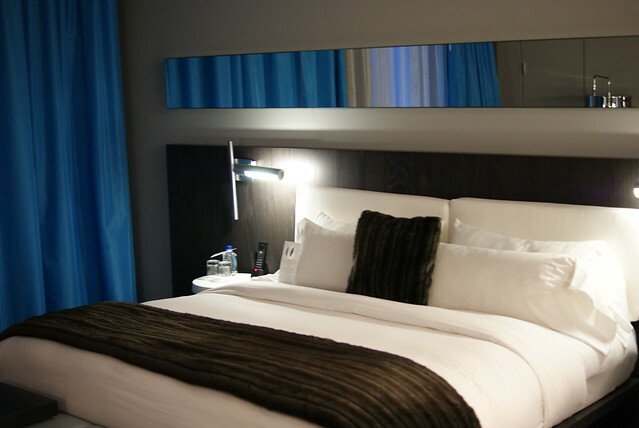 I had read many good things about this hotel online, with a lot people commenting on that it might be one of the best Starwood properties in North America. Many have said this because of the upgrades, especially for Platinums (too bad I’m only Gold), but also for the location (short walk to the old city) and service from the staff. Since I’ve become a bit of a fan of W Hotels (as pretentious as they can sometimes be), I figured I just had to try this hotel out. 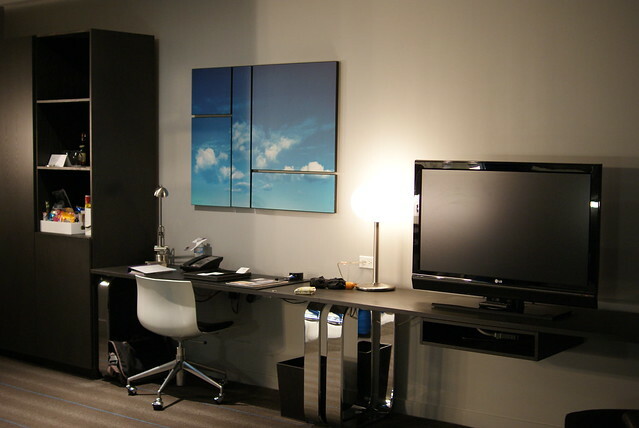 With that said, I booked a stay for my last two nights there, getting a Wonderful Room for about $270CAD/night. A little bit on the steep side, but then since I used miles to get to Montreal and Hilton HHonors points for my first night at the Embassy Suites, it didn’t seem so bad in the end. When I woke up at the Embassy Suites on that Saturday morning, the first thing I did was check my reservation for the W online, and to my surprise they had pre-upgraded me to a Mega Room for my stay! Considering that they sent me an email offer to upgrade to that room for $20/night and I decided not to act on it, this was a good thing! I’ll continue to say it, loyalty does have it’s perks! 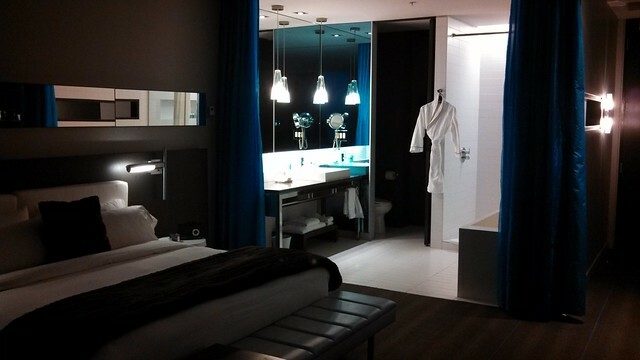 Upon check-in, my room was unfortunately not ready yet, as I was a bit early. They did offer to store my bag as I continued to roam about the city. On my return, later in the afternoon I was promptly given my room keys for Room 713 and I headed up while someone went to fetch my suitcase. 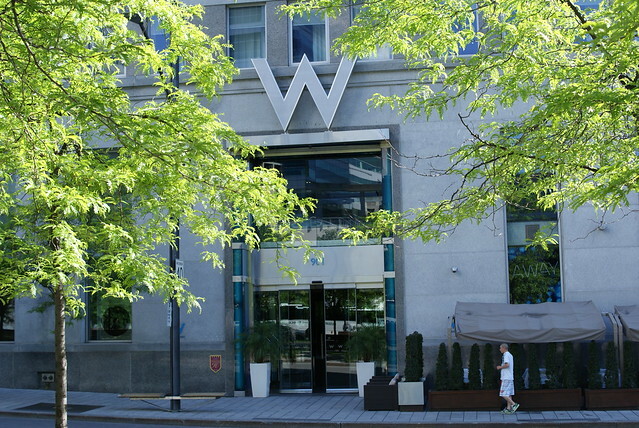 The W Montreal has plenty of amenities on the property as well, which is nice considering that it isn’t a super-massive hotel. There’s the Away Spa, a nightclub, a lounge, a W-operated bar, and a restaurant. I pretty much tried out everything but the restaurant, which although is apparently good, I wanted to try other places out in Montreal. As for the spa, I had a good experience, but they were booked up pretty solid for my stay, so I had to pretty much take what I could get since I failed to plan in advance. One of the nice things though, was that they gave me 30% off coupon when I checked in, but I’m not sure if that was because of my Gold status or not. On Saturday night, I decided to check out Plateau Lounge; I can only assume it gets that name for being above the lobby and opens out to it. Sitting at the bar, it wasn’t a terrible place. Yes, the prices sucked and I racked up quite the bar tab (with not many drinks), but the music was decent, bartenders proficient, and had a good laid back kind of vibe. I don’t remember how late it was, but probably around midnight or 1am I decided I had enough of the lounge and ventured downstairs to the lobby. Located on that level is both the nightclub and the small hotel operated bar (both the lounge and nightclub are run by an outside company or so I’m told). The nightclub, looked pretty packed and there was some definitely loud music coming from inside. There wasn’t a line, but I decided against going in for whatever reason. That meant hitting up the hotel bar, Bartini, for one a nightcap before I turned in. Bartini will probably hold the record for the smallest hotel bar (in a full service hotel; I’m not going to count places like a Hilton Garden Inn here) that I’ve ever been to. There were probably no more than 6-8 seats at the counter and that was pretty much it. It also wasn’t exactly busy either. When I pulled up a seat to the counter, I was the only one there. Since I had no idea what exactly what I wanted, I decided to let the bartender come up with something for me, and I wasn’t disappointed either (although what it was called, I don’t remember, because it was something in French). By the time I finished up at Bartini, I decided my best course of action was to go back to my room, drink some water, and go to bed. There was still another night in Montreal. Wunderbar, is the nightclub located in the hotel. I didn’t go on Saturday night, but decided to check it out at the end of my night on Sunday. I had expected that would have been like the night before (dark, loud music, packed, etc), but when I walked in as I got back from my other stops around town, it was the complete opposite. A few people scattered here and there, lights fully on, and no music. Not that I was disappointed, but apparently it operates more as a quiet lounge on other nights of the week. Drinks were essentially the same as the Plateau Lounge, some had slightly different names, and prices were consistent. One fun part was the bartender not having the best grasp on the English language and me knowing no more French than “Bonjour”, resulted in some interesting attempts at getting various drinks ordered. I enjoyed a few drinks and then turned in early that night since I was leaving the next day and wanted to have a few hours in the morning to roam the city. I hate to say it, but this is the part of my trip that felt as much like a do-over as any other part. Mostly because, with the weather throwing a wrench into my plans, I fell back on what I knew. That meant when I started walking through the old city that in a sea of way obviously touristy places I went to Creperie chez Suzette. I wont say that it is remarkable or anything, but I wish I had explored further down and hit the breakfast spot that I had found on my last trip (Marché de la Villette) instead. I mean the crepe that I got was good and everything, but part of me wanted something different. I have only myself to blame for that, though. 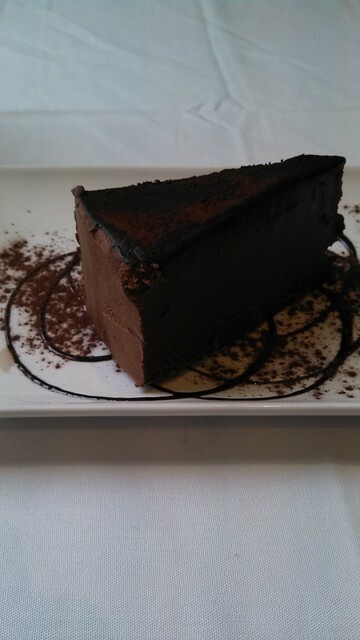 For dinner on Saturday night I went to the Vieux-Port Steakhouse. This place looked fancy enough from the outside to have a good steak dinner at to reward myself of several months of hard work back home. I didn’t bother with reservations, as I went fairly early in the evening; which was probably good, because I remember going past this place on New Years Eve 2012 and it was packed. On this night, not bad at 5:30pm (I was early so I could make it to the light show at the Basilique Notre-Dame. On to the food…I went with the Three-Peppercorn Steak served with mashed potatoes, a bottle (or two) of the Griffon Red Ale from McAuslan Brewing, and a slice of . I’d say that the steak was pretty good; I did like the seasoning that they put on it and it was cooked exactly to what one would expect to get when you ask for it medium. 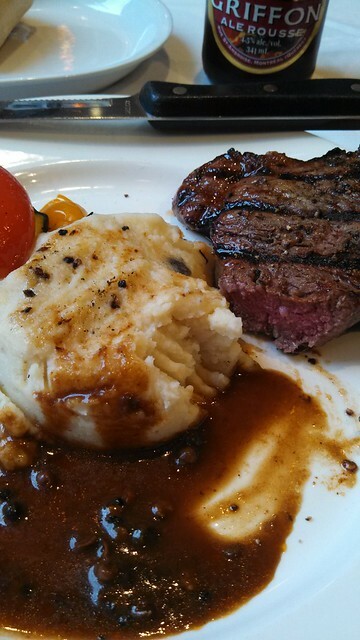 While, it was very good, it still didn’t dethrone the best steak that I ever had from the list. But, if one is looking for a good steak in the old city of Montreal, I would certainly recommend it. 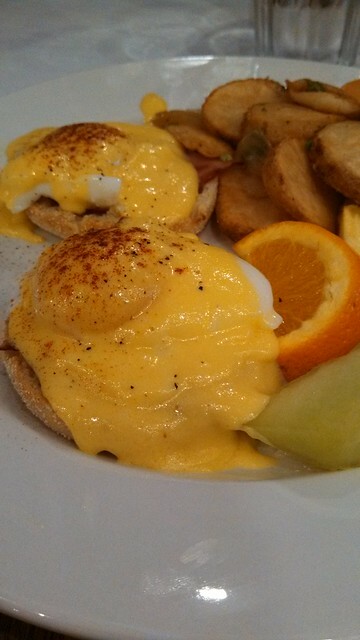 For breakfast on Sunday, I decided to try a place called Eggspectation. It seemed to get good reviews online, although some locals despise the fact that it has branched out from it’s original restaurant and opened several others in Canada and the US. I decided that some of those reviews were your typical ‘I don’t like change’ reviews (we get that a lot with places here in Panama City Beach), and while the perspective of those people is always good, its best to just see for yourself. And that’s what I did. Also, unlike the other reviews, for the location on Rue Notre Dame Est, I encountered no lines, no wait, nothing. It wasn’t empty, but it also wasn’t busy either. I ordered a pretty basic eggs benedict; I would say that it was good, but it wasn’t remarkably different from any other that I’ve had anywhere. So there’s that. I think everyone knows that I am fond of my beer. Montreal has some good options and plenty of places that serve up a good pint. I’ll save the majority of that discussion for the next section, but there was one place that had a good beer selection where I also managed to grab a bite to eat. 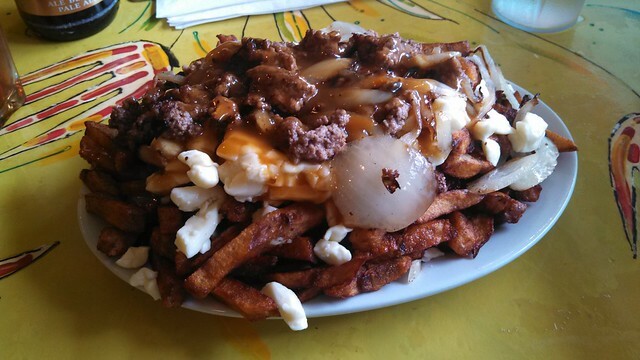 That place was Brutopia, located in an English-speaking section of Montreal near Concordia University. Don’t get me wrong, I came here primarily for the beer, but I did need to eat before a night out on the town, so why not kill two birds with one stone. To kill that bird, I had a Pepito sandwich (from the menu: Thin grilled steak served on baguette, coated with a black bean blend & topped with pico de gallo salsa). Good bar food? Sure. Gourmet by any means? Not really. Was it a good ambiance? You bet…there was live music (what it was, no one knows…or at least this American didn’t know), and I heard a good story. Actually, that’s the part I should relay to everyone here. This girl and her friend had come in looking to find a jacket she had left there the night before. The bartender said that he thought one of the workers took it home and described the persons she was with last night ‘to confirm her identity’. He then took her name and number so that he could call her when the jacket got brought back in. She was happy enough to do that and then left. It was after that when the story got interesting. It turns out that she indeed did leave a jacket the night before, but she also punched out a glass window in the front door trying to break in to get her jacket back after a few other bars and probably a few too many drinks. The best part, they had her on video and her friend had busted up knuckles, and of course she gave them all of her contact info. The workers were debating what to do…call the cops (what are they going to do) or perhaps try to scare her. Who knows what they ultimately decided to do, but the lesson here is that if you try to break into a place the night before, don’t go back the next day trying to get that item you left back. Don’t be that stupid. I also found myself at McKibbin’s Irish Pub on Bishop St/Rue Bishop. I previously found myself here on New Years Day 2012, in my search for a local, but English-speaking place to grab a drink. On that visit I had sampled the food and had a few beers, but this time I was just drinking. 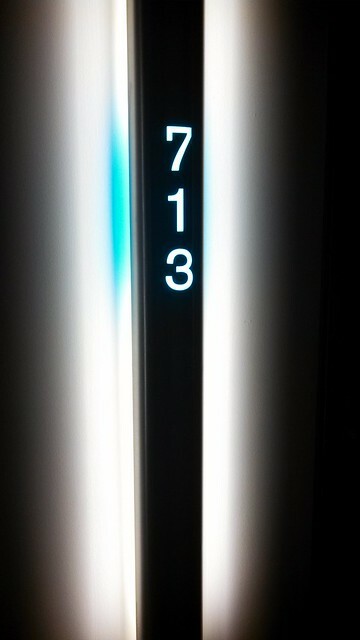 There’s a decent number on tap. Most of the beers are what you would expect to find in an “Irish Pub”, but I think I’m just partial to the ambiance of this place. There wasn’t any live music on that night, but it’s just a good place to sit and watch a game on TV (on that night, it being Canada, it was Hockey). There is more to Montreal than just eating and drinking, although those are two things that I have found Montreal to be quite excellent for. My plans for the weekend had been to be outside as much as possible during the day, but the rain pretty much killed it. I really wanted to hike around Mont Royal, but again, the rain killed that idea. As a result the first day there, was me pretty much hitting up places I had already been to. 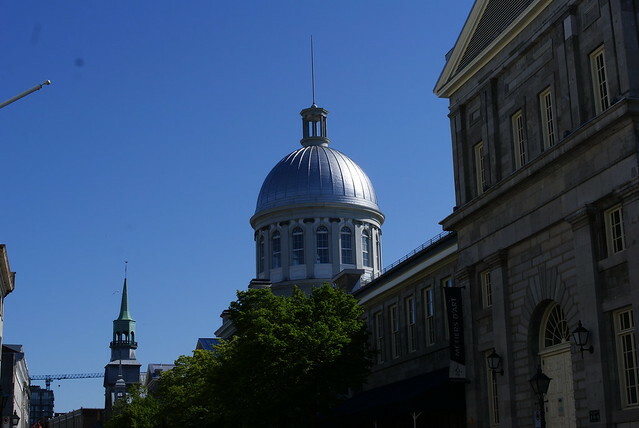 My plans were in disarray, but wound up wandering around the streets of the old city and browsing the shops in Marché Bonsecours. Then after some more wandering, I found myself in some sort of small street event in the old city that had a few short roads around the Old Customs House and Place Royale. Stands and food trucks selling everything from macaroons to plates of fish. 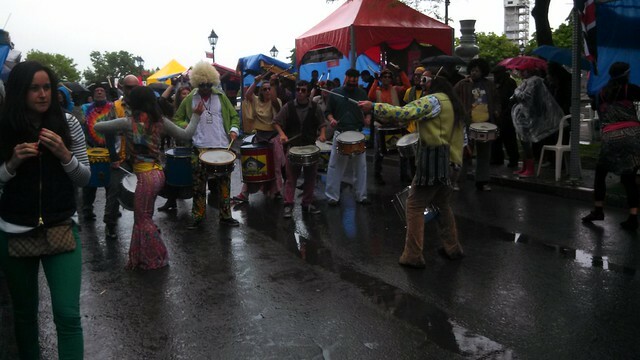 I have no idea for what reason this was going on (couldn’t read any of the French-language signs), but I sampled a few things and took in a crazy drum band that marched their way right through the middle of the street. Did I have a clue what was going on? Nope. Was it fun? You bet. One of the things that Montreal has, is several markets (Marché), typically where one can by produce and other goods, that I believe are run by the city. I had attempted to go to two of them on my last trip, but due to the holiday, they were all closed. I had read good things about some of the shops and food stands within the markets, so this time I knew I had to make the attempt. 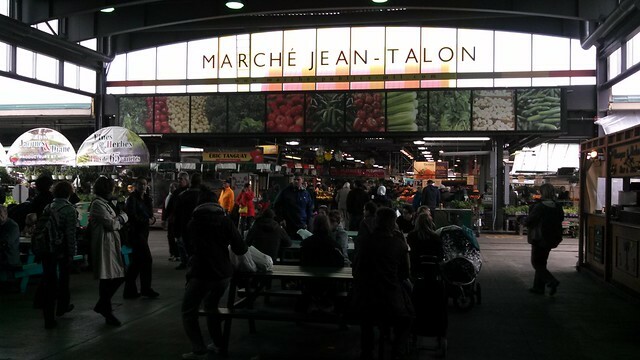 I headed for Marché Jean-Talon, for some post-lunch wandering. This may not necessarily seem like me, but actually just browsing markets like this is something that I actually kind of like to do. I’ll be traveling somewhere and stumble on a market like this or an impromptu one setup in a park on a closed street and next thing I know I’m in the middle of it. I think part of it is that it allows you to experience the local side of things, plus I’ve had some tasty treats from random stalls at markets like this. 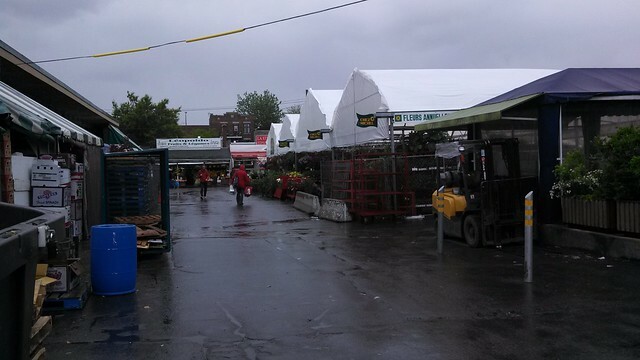 Montreal was no different from anywhere else; a collection of produce and floral stalls, specialty shops selling fish, cheese, wine, etc, you name it. I of course did not walk away with bags of produce or really anything for that matter, but I did manage a few macaroons. Not going to lie, they were pretty tasty. One of the most beautiful churches that I have been to (and yes, that’s including some much older masterpieces of architecture and art in Europe), is Montreal’s Basilique Notre-Dame. It’s not incredibly massive, but the artwork and feel inside is just impressive to me. I’m no good at explaining these types of things, just look at the pictures below as proof. 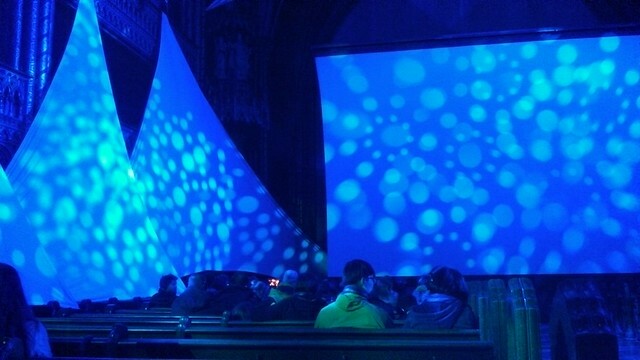 Aside from just visiting this church again, the real reason I had come here again, was that they put on a presentation/light show of sorts at night inside. 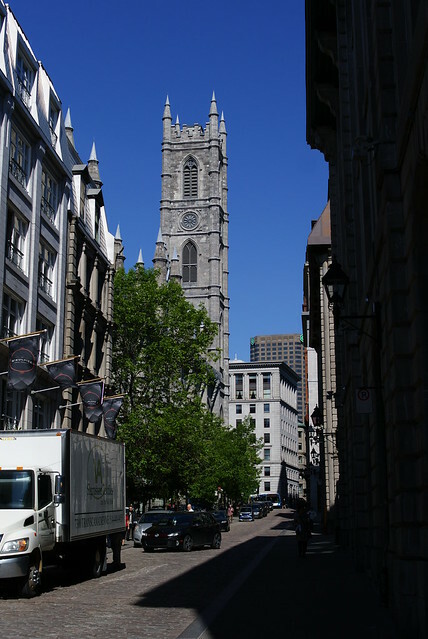 It’s the history of the Basilica as well of early Montreal, and aside from some low-quality acting, it wasn’t too bad. It also wasn’t as light-show-y as I had thought, but hey, it was just another thing for me to check out. Like how all the markets were closed on my trip in 2012, so were all of the museums. Luckily, the Sunday that fell on this trip was Montreal’s free admission day to all of the Museums in the city. The Pointe-à-Callière Museum (Montréal Museum of Archaeology and History) was probably the most interesting of the two I visited. This one occupies several buildings around Place Royale, as well as beneath the streets. The big draw here, is the archeological site of the old, old city of Montreal that lies beneath the buildings. It’s mostly the remnants of walls and some foundations, as well as a few tunnels and the random pipe, but it’s always interesting to see what they find in these kinds of excavations in terms of items from the period. Coins, tools, toys, etc all from a previous era. The history nerd that I am, definitely had fun here. 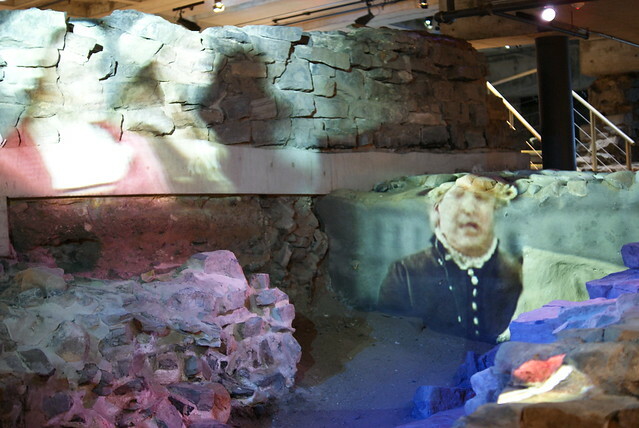 Pointe-à-Callière Museum – Ruins of the Old, Old City. The Centre d’histoire de Montréal was the other museum that I decided to check out and is on the other end of Place D’Youville from the Pointe-à-Callière Museum in a former firehouse. 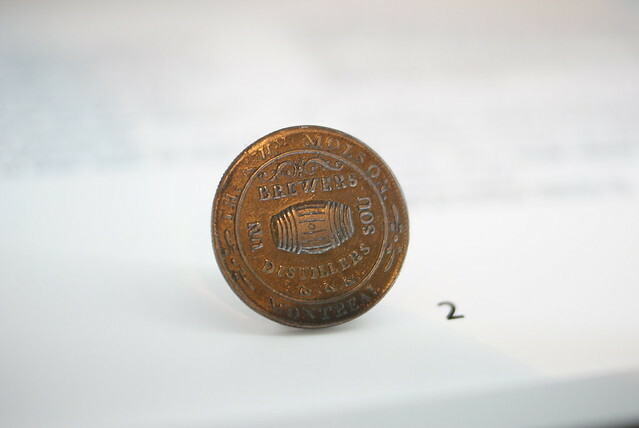 This one is the overall history museum of Montreal with exhibits in the main hall going through the main periods of history of the city with selected artifacts from each time period. 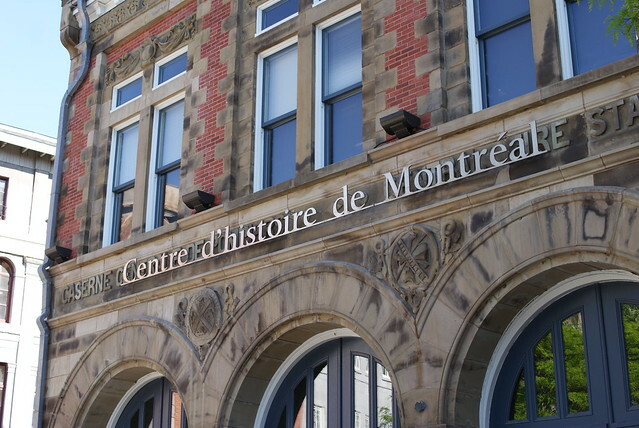 Since I had already gotten a dosage of early Montreal history it was the more turn of the century and modern history of the city that made this museum interesting. The exhibits are on the small side, but it does give you a pretty good overview of the history of the city beyond just walking around the old city. 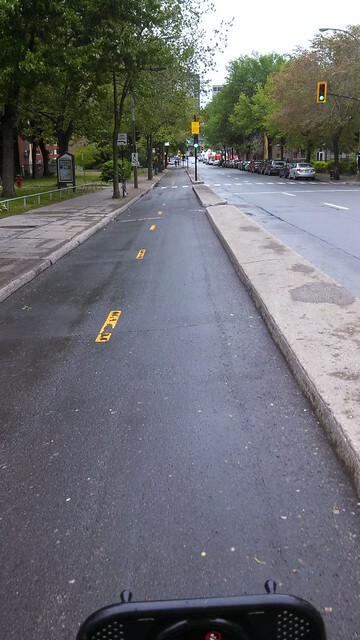 A good way to explore Montreal, I discovered was by bike. With no maps, I rented a bike after a late lunch at La Banquise to make my way back to the center of town. It’s all downhill since you’re making your way from out near Mont Royale, and it’s a fairly easy ride. I want to say it took about 30 minutes, maybe a little more, and there were bike paths or separated bike lanes for a large portion of the route. However, as I got into the city center, the bike lane ended abruptly on me and I found myself riding amongst the cars in Canada’s second largest city. I’ve never quite biked on the surface streets in a large city, but I didn’t wind up getting hit, so I guess that’s a win. When I did make it to the old city, I biked around for a little bit before returning my bike to one of the many convenient Bixi kiosks. 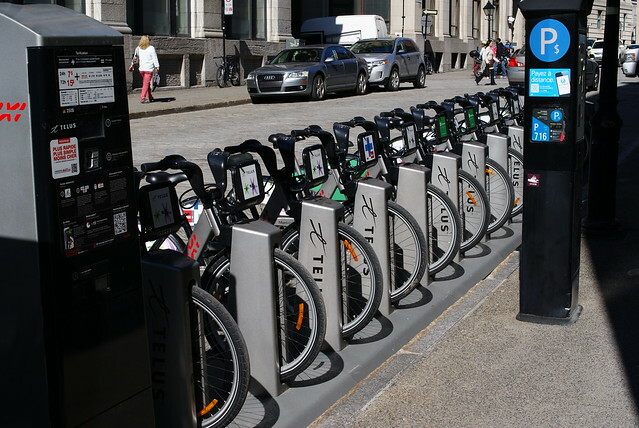 Oh, and since I didn’t make a note of it up front, Montreal is covered by a bike share program and there are kiosks everywhere. It’s a great way even for tourists to get around, and the cost is pretty minimal. All you have to do is have a credit card and you’re good to go; no pre-registration or setup is required. 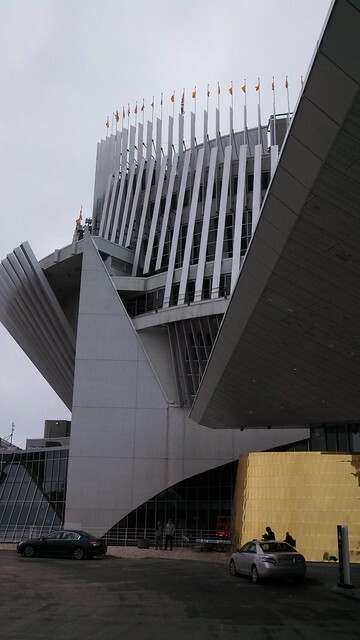 I also swung by Parc Jean Drapeau, where I checked out an outdoor equipment expo of sorts and ventured over to the Casino de Montreal for a quick gamble. I didn’t win big (or anything for that matter), and as I managed to get to the park as many of the attractions were close to closing, there really wasn’t anything to see that I hadn’t already. Also, for what it is worth, the Casino was undergoing plenty of renovations. Still managed to get turned around in there in the labyrinth that it is. I know, I’m terribly behind on pushing these last two posts out, but hopefully, I’ll finish up the last one after this shortly. Keep tuned for updates! This entry was posted in Canada, Photography, Travel, Trip Report. Bookmark the permalink. Follow any comments here with the RSS feed for this post. Post a comment or leave a trackback: Trackback URL.